Last fall, we learned about a timely, developing documentary called Beyond the Brick: A LEGO Brickumentary that would take a closer look at the international building block toy sensation by focusing on Adult Fans of LEGO (AFOLs), fan conventioneers, LEGO artists, and famous LEGO fans along with the kids who love the LEGO toy sets so much. THe film debuted at the Tribeca Film Festival earlier this year, and now Radius-TWC has picked up the film for distribution worldwide. 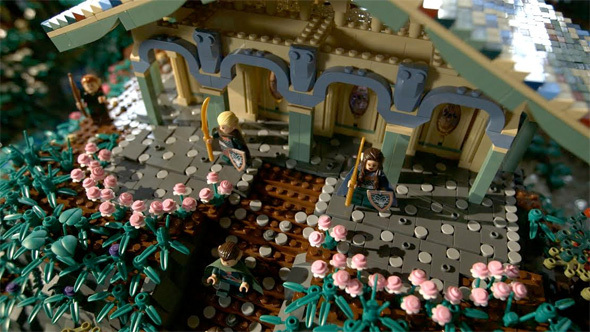 In addition, two photos from the documentary have been released, showing off a massive Lord of the Rings homemade LEGO set. Look now! Oscar winning filmmaker Daniel Junge (Saving Face) and Oscar nominated director Kief Davidson (Open Heart) are behind the film that couldn't have come at a better time. Junge explains, "The LEGO brand is everywhere, and this documentary is an examination of its footprint in our global community. The LEGO brick has transcended language, politics, age, race, art, science, and technology—all through its ability to draw out the basic human need to create and share our creations.” And with the success of The LEGO Movie, this might even be a documentary that could be interesting for kids as well. Interested? I would love to build a huge Lego model. Just need the tens of thousands of dollars of disposable cash it takes. I'm looking forward to seeing this.